Justice for Pearl (Also Known as "Chantel Girl" and "Beauty") - PLEASE SIGN!!! TSTEVEN ERRANTE IS CHARGED WITH ANIMAL CRUELTY AFTER ALLEGEDLY SEVERELY BEATING A DOG WITH A BASEBALL BAT. "This is the worst case of animal abuse that I've seen in my 20-year career," Det. Sgt. John O'Sullivan told reporters Saturday. PLEASE SIGN!!! Signed and shared. Thank you, Judy. SIGNED !! thank you, Judy. signed and noted Judy thank you. Signed. May this POS rot. Signed & Shared! This sweet and innocent soul suffered such abuse from this man! 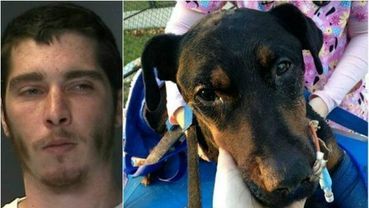 I hope that he has to spend a significant amount of time in jail and I fervently hope that the judge will give him a lifetime ban of ever owning another pet again! But I know that he will burn in hell for what he did! signed. Ilona, I saw it too! Signed & Shared. Thank you very much Judy for sharing this petition. People who do things such as this are beyond contempt. Signed and noted. 4,352 signatures, need 648 more. I hope this slime ball gets a badass dog lover as a cell mate and a long jail sentence. Sadists should be put to sleep for good. Signed, thanks Judy. N&S. Hope someone, in his words, 'basically beats him with a baseball bat'. Sick SOB. S & N! QUITE OBVIOUS THAT THIS POS NEEDS TO BE REMOVED FROM SOCIETY, PERIOD! I would beat him so much that he would wish he had never been born! Wonder how many people he's abused...?? If not yet, then soon he'll start on humans. Animals abuse & murder, should be a AUTOMATIC punishment..These monsters don't just stop beating animals 2 death! Stop giving them ANY RECOGNITION, that's what they want! Luv 2 meet this ape in a alley!!! RIP Pearl (and "Chantel Girl" or "Beauty"
Noted and Signed ! It Breaks my Heart every time I see or Hear of Abuse of any Animal ! Animals (Pets) are like children ! They depend on US for Care,Food,Love,I'll Never understand Why people Hurt Animals ! The only thing is that they are SICK and Demented and should be in a Prison or Hospital for LIFE ! Rest in Peace Pearl ! Thank you for signing the petition "Justice for Pearl (also known as "Chantel Girl" and "Beauty")"
Heartbreaking... Noted, signed and shared. I hope a-hole gets the maximum punishment! Noted and signed, thanks Judy. S+N This man deserve a good batting himself. I mean I would love to give him a bat on the head, creep, he even looks mean. Such sick bastards have no right to live on our planet.